This tomato sauce is so creamy, but there’s no milk or cream in it! How is that possible? Magic I tell you! 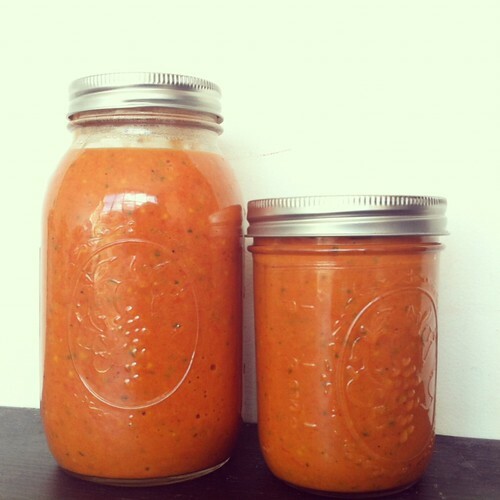 So with this recipe you will receive 2 things: one delicious creamy tomato sauce, one delicious smelling kitchen. It’s like Christmas with all the presents you’ll receive! Look at this sauce! Besides the roasting time, this is quick to make. 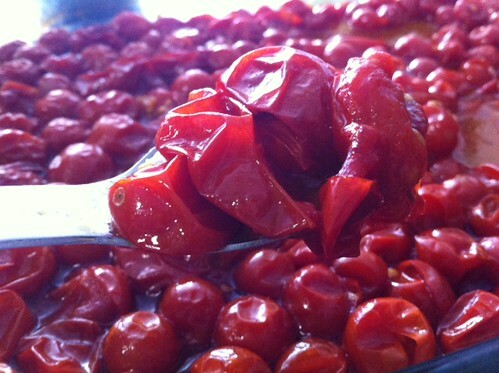 Spread tomatoes in a pan. Sprinkle with your onion powder. Drizzle with some olive oil. 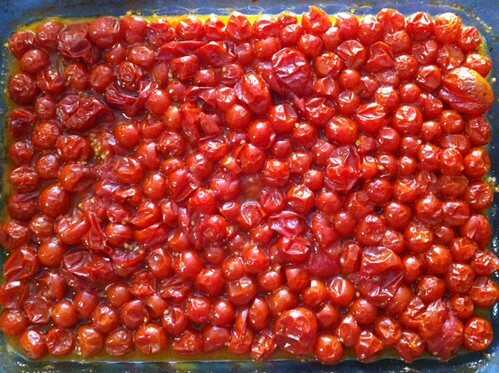 Bake for 35 minutes, your tomatoes should be wrinkly. 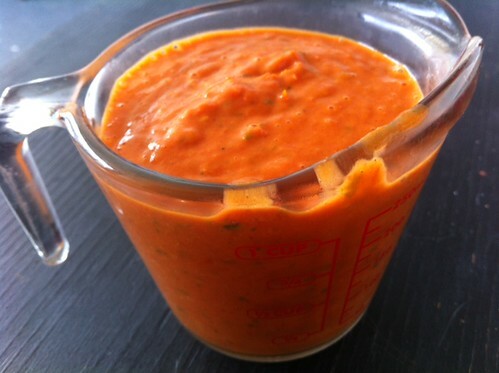 Let cool for a few minutes, then put tomatoes in food processor. 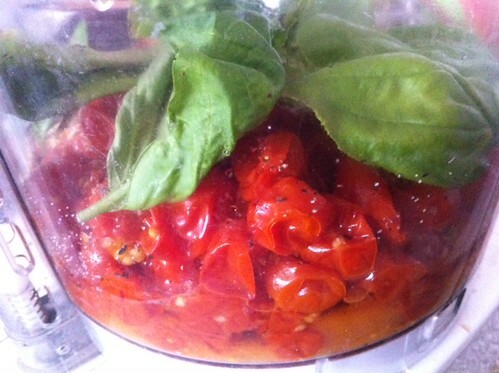 Add olive oil, fresh basil, garlic powder and salt + pepper to taste in food processor. Blend to smooth and creamy. Use it right away, or throw it in the fridge to use tomorrow, or freeze it for next month. Just be sure to throw it over some pasta and enjoy! Full step by step pictures behind the cut. Every time I walk by the kitchen I feel guilty. Why? 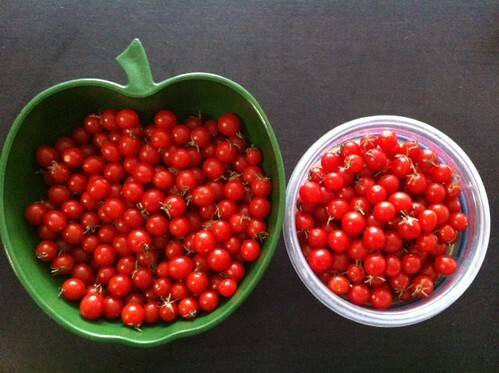 Because there’s always pounds of tomatoes there waiting for me. There’s always something tomato related I could be doing. Work? Sleep? Nah, just make something with tomatoes. 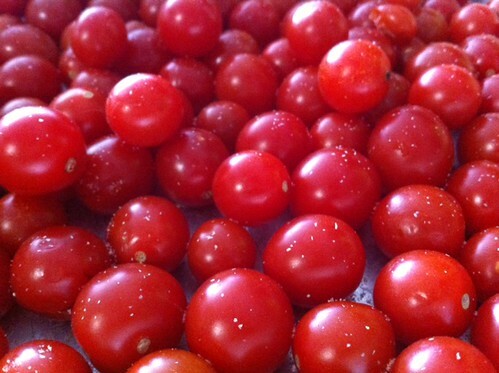 I have a tomato sauce recipe I love dearly, but I wanted to try something new with our grape and cherry tomatoes. 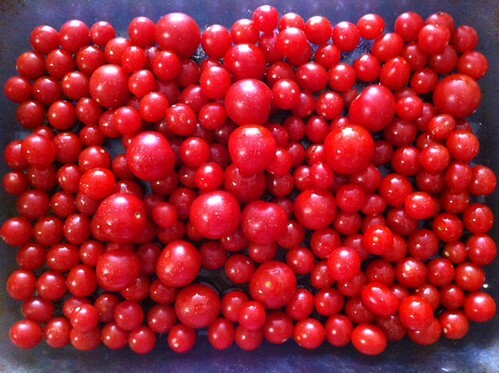 We are swimming in grape tomatoes. Who knew just a few plants could produce this much (and keep on producing!)? 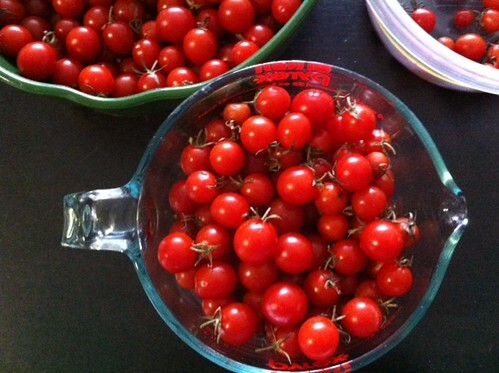 To get an idea of how many grape tomatoes we have right now, this measuring cup is full of 4 cups of them. The green bowl in the background hasn’t even been touched yet. 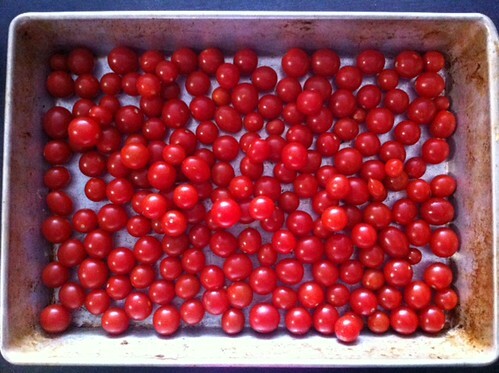 Step 1: Put tomatoes in a pan. 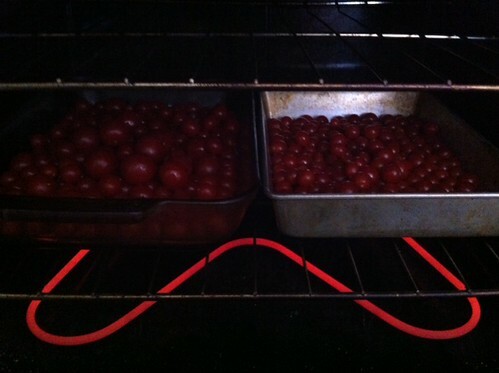 I was making a few batches so I used 2 pans. Make sure they’re destemmed too, I know it’s a pain. Sprinkle some onion powder on them.. Into the oven they go for about 35 minutes. 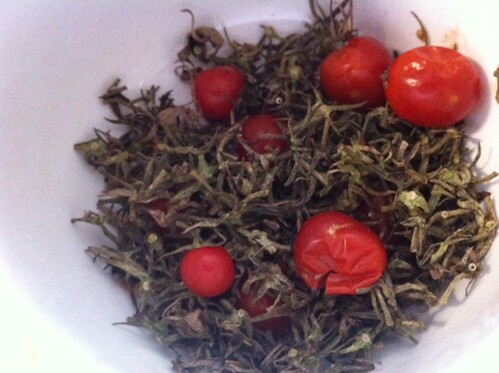 Compost the stems and any bad tomatoes you discovered in your endless bowl of tomatoes. 35 minutes is up, they will come out like this, smelling like glory. Wrinkly and beautiful I mean. 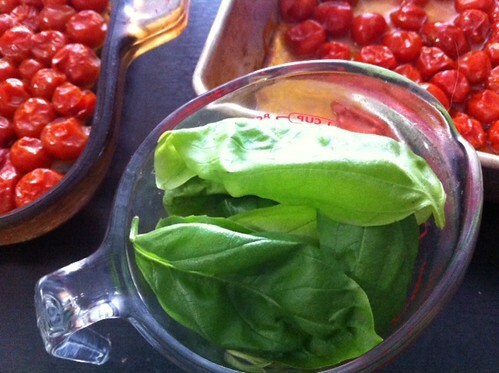 Let the tomatoes cool for a few minutes, in the meantime gather some fresh basil. 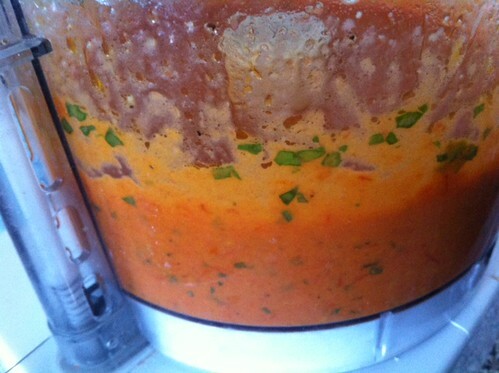 Add all your ingredients to the food processor. Pulse for a few seconds, it doesn’t take long. It will magically turn into this. 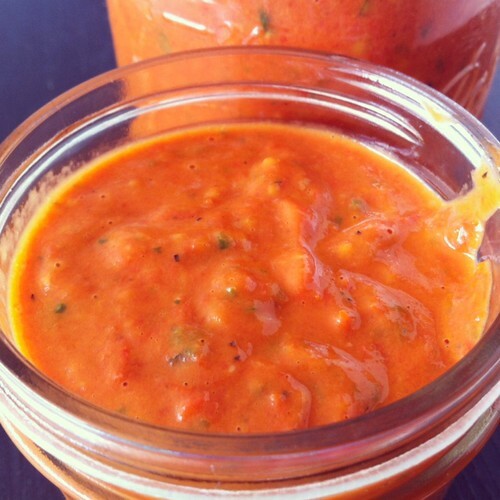 The tomato sauce is very creamy, it almost reminds me of tomato soup (and in color). Ooo…. that looks delightful. 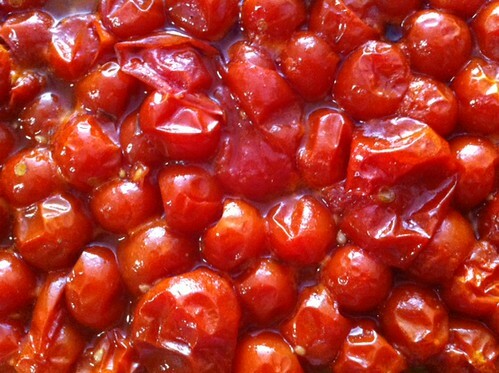 I love, love, love roasted tomatoes. I’ve got a bunch ripening on the counters now so maybe I’ll try some soon. I hope you enjoy it! I’m having it tonight with some pasta and garlic bread. MMMM.